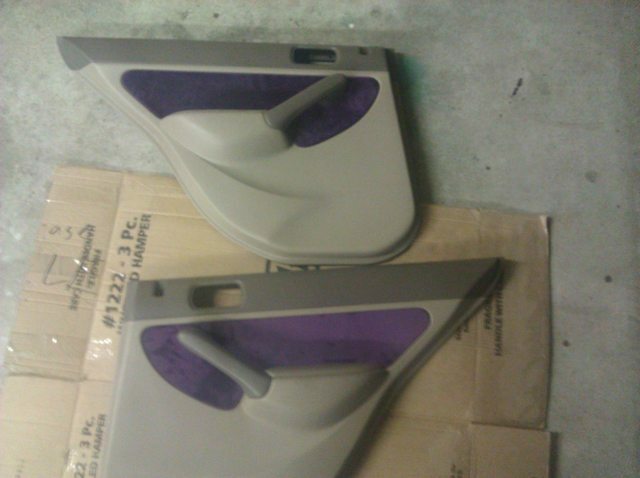 Re: DIY: Change the color of your door panels with suede!! Thanks! I gotta give credit to you, bc without your help talking me through all of this, and your DIY guide on taking the door panel's off.. this never ever would have happened! you can even go back to when I was sayin "im not takin the panels off, i dont wanna break nothin" from previously.. so thank you so much again for all of your help. I'm very happy with how it turned out. that is very true. and i am glad that i decided to go through with it.. super thanks to gearbox and your DIY about how to get the panel off. i printed it out and had it with me while i was takin it off lol.. but hey, i did it! this is what i used..
i dont know if it would stand up to AZ heat, but it works pretty good. i might be re-doing my doors soon bc i found better/thicker fabric i wanted to use. and might try out that 3m super 77 mulitpurpose adhesive (purple cap) next go around. just make sure i dont have any issues.. i know if you pull fabric away from where it was laying with this stuff, it comes off fairly easy.. but then again, i used pretty thin fabric. but if i do it again, i want it to stick and be stuck for good. lol..
but yeah, this is what i used. its at JoAnn's fabric store. you have to be careful because thiner glue can bleed through fabrics 3M general trim adhesive is designed just for this purpose. you also want to spray both the fabric and what your attaching it to in opposite directions also let it get tacky before you attach it. 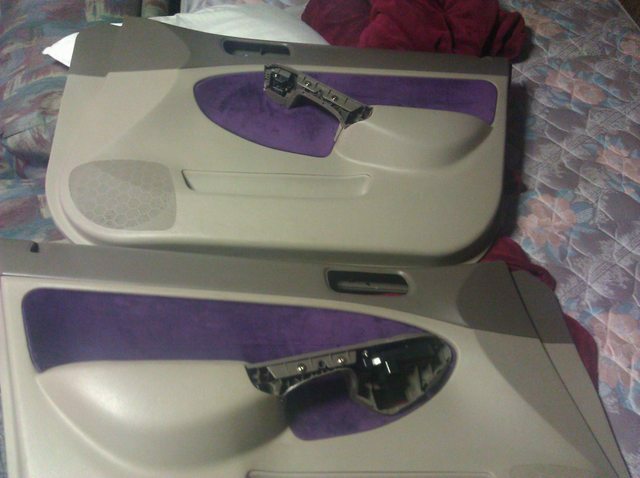 wish i woulda known that before i did my door panels.. i just sprayed them and layed the fabric on it.. oh well.. might be re-doing them soon anyways, i got better fabric today. so we'll see..
that glue looks like it would most likely be for scrapbooking since it is acid free and probaly wouldnt be that strong. i just need a glue that can stand up to 160+ temps. yeah it does get that hot in the car. Last edited by wade623; 07-17-2011 at 04:48 AM. i like things to kinda pop when you look at em, and if it was my car with those colors, i'd match the green you have on the outside and bring it inside to the doors. dark green and tan dont look bad together, and i think it'd look good honestly. and they have had a dark green microsuede color at JoAnn's the past couple times i have went that looks good. i'd go check out fabrics you like first, and see if you can get a good match to the color of your car. but thats just my $0.02. and yeah, dunno if that spray would hold up to 160 degrees. i'd try the 3m spray for sure..
Ive seen the green done in our cars, looks bomb, and the color I saw was almost exactly like the car color. So, what kind of sude fabric do I need to get to do my door panels? Also I should use the tape and not the glue? Where should I go to find out how to put in the new fabric on the door panels? you can pick any fabric you want really.. mine isnt suede, although i wish it was.. they just didnt have the color i was lookin for.. but at joann's fabric store, they have microsuede that i'd get.. feels nice.. i know gearbox was telling me about a certain super thin tape he used, and i dont believe i got the right kind, bc when i used what i bought, it left lines.. if you go back a couple pages and skim through mine and his convo back and fourth, you'll see the mess up i had with tape. anyways, i ended up using spray glue and it worked great for me. Thanks civicchick for pointing me to this thread! dannnng! that looks good! i like it a lot! good job! what kinda fabric did ya end up usin?? whatever u used, i like it! Not 100% sure, receipt says "blackberry velour" It wasnt too expensive either, about 6.99 a yard. I have a lot left over so I want to make something for my trunk! surprisingly goes really well with the tan interior. Did my drivers door last night. Used 3m super 77 spray adhesive and black microsuede. Used tarminator to remove the old adhesive. Spray light and no bleed through. Came out pretty nice, complements my rsx leather seats very well. Gonna do my passenger door today and start the rears, I'll post up more pics when it's done! Last edited by MassCivic; 05-05-2015 at 09:19 AM. Finished the passengers front door last night. Came out pretty good as well. Also stopped by the pick n pull on he way home and pulled a new door lock actuator for the passengers side and found a set of black door handles to go with the new black microsuede! Unfortunately, being a sedan this means I still have to do the rears, but it's fun so no biggie! Thanks for the great DIY and all the info! I have had suede in my car for a couple years now, and just a fair warning, it of course will fade over time. As you can see, my suede has faded from black to nearly a midnight blue. Is door wiring hard to fix myself? Quick Reply: DIY: Change the color of your door panels with suede! !